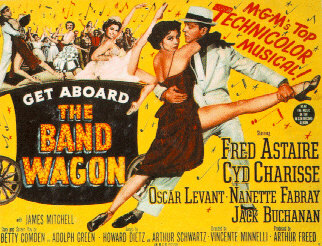 The name "bandwagon fallacy" comes from the phrase "jump on the bandwagon" or "climb on the bandwagon", a bandwagon being a wagon big enough to hold a band of musicians. In past political campaigns, candidates would ride a bandwagon through town, and people would show support for the candidate by climbing aboard the wagon. The phrase has come to refer to joining a cause because of its popularity. Everyone is selfish; everyone is doing what he believes will make himself happier. The recognition of that can take most of the sting out of accusations that you're being "selfish." Why should you feel guilty for seeking your own happiness when that's what everyone else is doing, too? Source: Harry Browne, "The Unselfishness Trap", from How I Found Freedom in an Unfree World (1973). The Bandwagon Fallacy is committed whenever one argues for an idea based upon an irrelevant appeal to its popularity. Advertising is a rich source of Bandwagon arguments, with many products claiming to be "number 1" or "most popular", even though this is irrelevant to the product's merits. Therefore, X is correct. Idea of a specific politician being president is popular. Therefore, the specific politician is the more competent leader. However, I am unable to verify that this is the case. It also conflicts with the possibility that the election of a leader based on his/her popularity is not to determine whether the selection is right or wrong, but rather to fulfill the desires of the people. I hope to hear your opinion on this issue.―M.F. A: Your latter suggestion is on the right track. Keep in mind that a logical fallacy is a type of argument, that is, a set of propositions consisting of premisses and a conclusion. An election is not an argument with the conclusion that, say, a certain candidate will make the best president; rather, an election is a way of selecting a candidate for a position. Since an election isn't an argument, a fortiori, it isn't a fallacious argument. So, to criticize democracy as a bandwagon appeal would be to commit a category mistake, because a political system is not the sort of thing to be fallacious. A genuine instance of the bandwagon fallacy is the argument that you should vote for a certain candidate because the majority of people support that candidate, or the candidate is popular. This is the origin of the phrase "to jump on the bandwagon". Of course, none of this is to say whether democracy is the best, or even a good, way of choosing candidates for office. However, it is to say that evaluating democracy is not a purely logical question, but an ethical, philosophical, and even empirical question. S. Morris Engel, With Good Reason: An Introduction to Informal Fallacies (Fifth Edition) (St. Martin's, 1994), pp. 223-225. James B. Freeman, "The Appeal to Popularity and Presumption by Common Knowledge", in Fallacies: Classical and Contemporary Readings , edited by Hans V. Hanson and Robert C. Pinto (Penn State Press, 1995), pp. 265-273.